Every day, people around the world are faced with dangers in their work environment, within the home, at school or while simply enjoying their favorite activities. 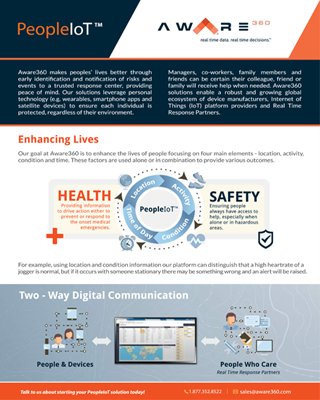 Aware360 PeopleIoTTM solutions leverage personal technology (such as smartphone apps, wearables and biometric sensors) to identify risks, generate real-time alerts and notify those responsible to guarantee help will be there when you need it most. In this solution brief, you will discover what PeopleIoTTM is, the key elements which make up PeopleIoTTM solutions and which use cases are solved with this new IoT technology.